President Trump may be focused on saving coal miners, but solar continues to be the hot spot in today's jobs market. "It seems to be one of the few areas of high-paying, blue-collar jobs -- and you don't have to learn to code," said Bryan Birsic, CEO of Wunder Capital, a fintech company that allows investors to help finance solar panel installations. Awareness is also up as Americans concerned about climate change look for cleaner energy options. Elon Musk has helped add to the solar buzz. Musk's Tesla recently started taking orders for solar roofs that is made of shingles to ease concerns that solar panels are ugly. Most solar workers are in the installation business, the IREA report showed. Other leading jobs include manufacturing, project development, sales and research-and-development. Men have most of the jobs in solar, but that is starting to change, especially in the sales business. 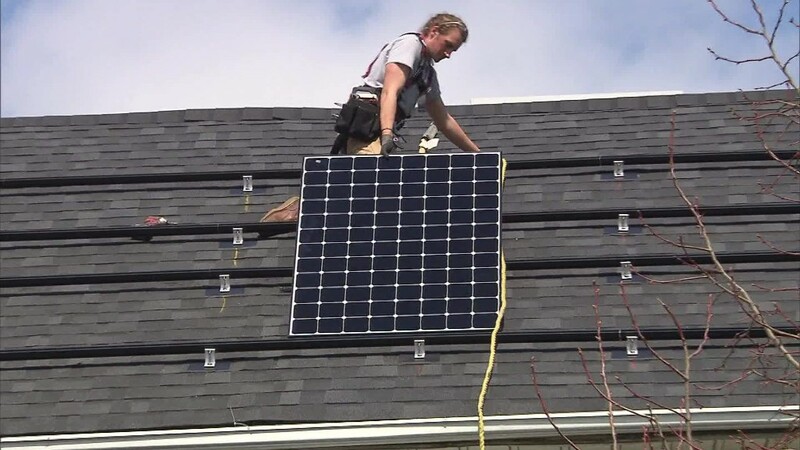 Women now hold 28% of solar jobs, up from 19% in 2013, IREA said. By comparison, women make up just under half of the US workforce. Solar isn't the only hot part of the clean energy job market -- wind jobs grew by 28%. About one-quarter of the roughly 102,000 jobs in the wind business are in manufacturing. Both solar and wind scored a big victory in December 2015 when Congress decided to extend renewable tax credits that were set to expire. The coal mining industry is grappling with far tougher conditions right now. Almost half of US coal jobs have disappeared just since the end of 2011, according to a Columbia University study. Kentucky, a state that overwhelmingly voted for Trump, lost an incredible 64% of its coal jobs over that span. Attempting to revive coal jobs, Trump has signed executive orders aimed at easing the regulatory burden on the industry. But Columbia's study warned that Trump's regulation-busting is unlikely to spark a revival because coal's main problem is the abundance of cheap natural gas, not regulation. Besides being better for the environment, the solar industry is considered to be fairly labor intensive. Wunder Capital's Birsic said that's because unlike fossil fuels, solar energy in the form of sunlight is available in many environments naturally. That allows for more costs to go towards paying workers to install, manufacture and sell solar panels. "Sunshine is free. You don't have to bring sunshine out there in the desert," said Birsic. Solar costs have also come down dramatically. Birsic estimates that solar energy was 50% more expensive just five years ago. "It's showing no signs of stopping," he said. While renewable energy job growth has slowed globally in recent years due to declines in Japan and Europe, IREA believes it will accelerate again. The group predicted that global renewable energy employment will nearly triple by 2030 to 24 million. "The scales continue to tip in favor of renewables," the report said.